How to create content that effectively works across various audiences? 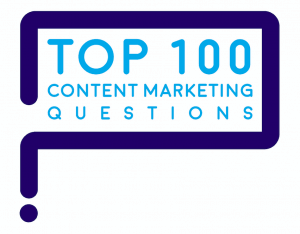 “How can we create content that effectively works across various audiences?” is one of marketers’ Top 100 Questions about content marketing. That answer comes from sci-fi author Arthur C. Clarke. Because there’s no artificial intelligence empathy machine yet, marketers take 3 approaches to ensure that the they create content that effectively works across various audiences. Too often marketers and executives assume they know who the buyers are and how they behave. The problem is, they can’t see what’s happening when buyers are offstage, out of sight. Much of the drama in the buyer’s journey happens offstage. 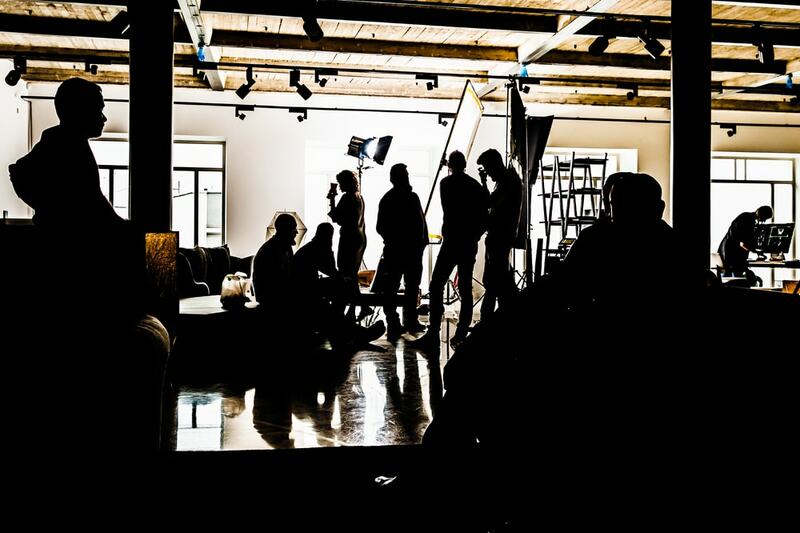 Buyer persona research gives you a backstage pass to see that action. Exactly how they reached a final purchase decision. For example, one client believed that it needed marketing to address 5 separate buying decision-makers – plant managers, specifying engineers, mechanical contractors, distributors and OEM customers. 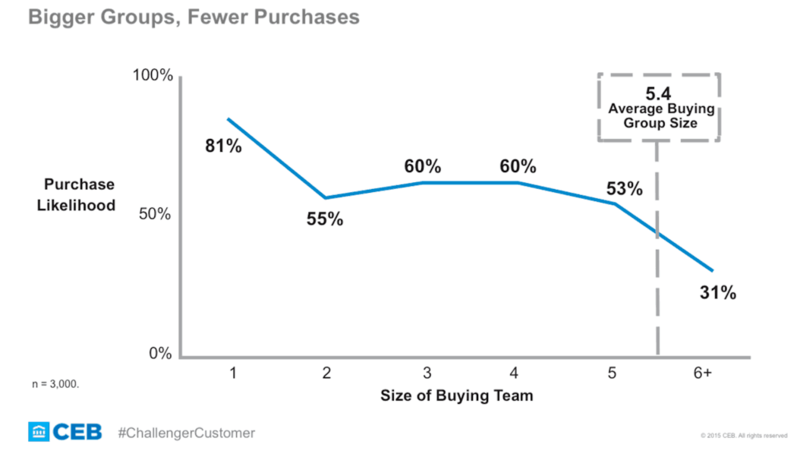 But buyer persona research revealed that only 2 of the 5 played any key role in making purchasing decisions. The others only rubber-stamp the decisions or follow orders. With that insight, instead of splitting the marketing budget 5 ways, the client focused all the money on the 2 buyers who mattered most. What’s more, buyer persona research revealed the ground truths about the buyers, their motivations and behaviors. Couldn’t care less about the price, as long as the product meets his exact need. 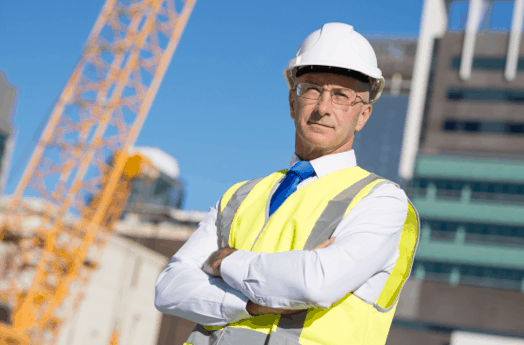 Civil and chemical engineers like Ed have ingrained information habits you need to know to help them find content marketing. Couldn’t care less about the brand. 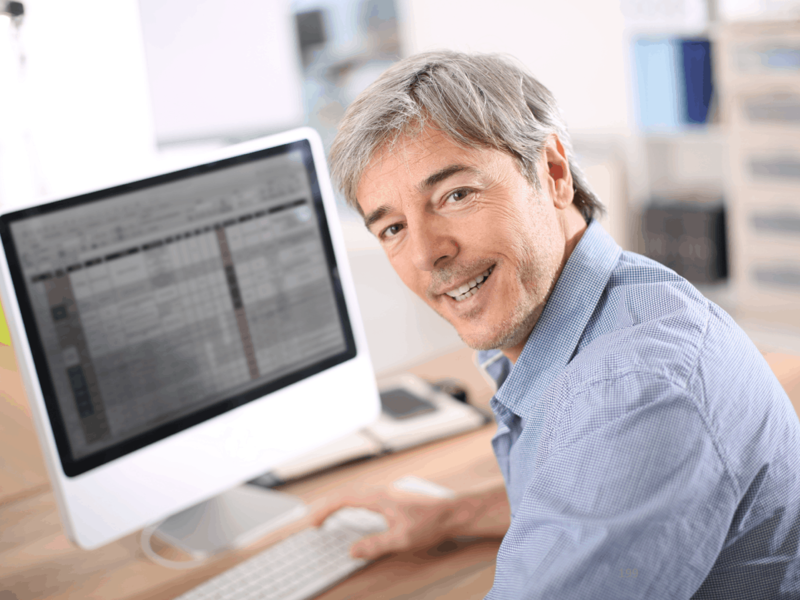 Industrial distributors like Dan focus on getting transactions done quickly. The key insight from buyer persona research: Ed and Dan drive every moving part of the buying decision. Even though the purchasing department appears to have influence when it buys from Dan, purchasing simply follows Ed’s orders. You can only get that kind of insight from buyer persona research. Customer chat, customer service and customer emails. What are buyers’ most important questions? How buyer questions vary at each step in the buyers’ journey? Where are the pitfalls that block buyers’ progress? 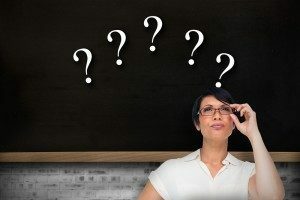 Knowing buyer behaviors and questions gives you tremendous insight and the confidence to create content that effectively works across various audiences. 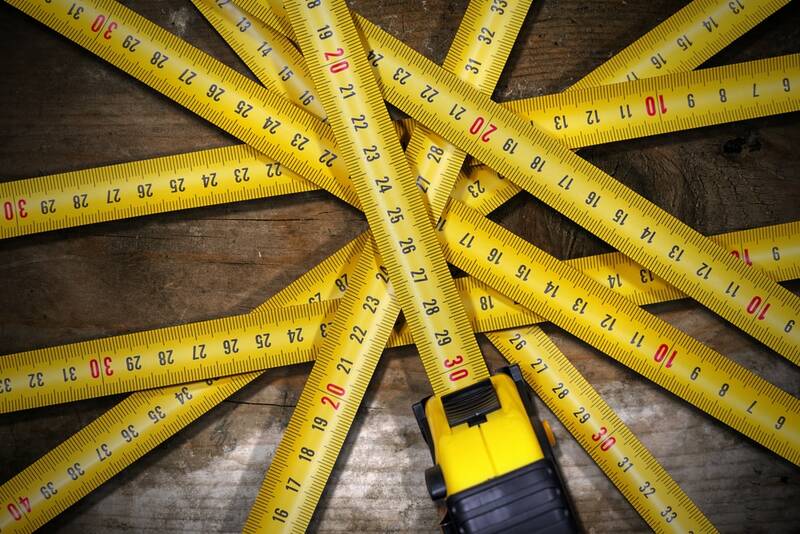 To extend your content marketing success, learn from analytics and metrics. 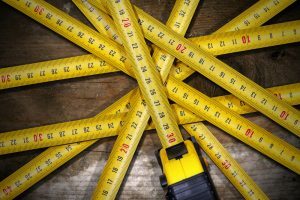 Once a month, review the performance of all your content – on your website, in PR, at events, email – everything you can measure. Which content is most compelling to your existing users? Which topics, headlines, media and formats do they use the most? Detect the patterns that lie within your successful content assets. Experiment with the winners. Run A/B tests that can make your content even more successful. You can begin to see the world through buyers’ eyes by knowing their behaviors as they engage with your content. Clearly, that’s the way marketers think about content. Unfortunately, it’s not how buyers think about content. Buyers are looking for quick answers to their questions and relevant information to make them into smarter buyers. Instead, buyers are looking for answers to their questions, information that’s relevant to their needs, and social proof that the information source can be trusted. Business-to-business marketers often need to sell to a buying team, especially on carefully considered purchases with large price tags. It’s typical for the team to include a technical buyer from the department that will use the product, an economic buyer from purchasing, product users and others. Buying committees usually bog down, says the Corporate Executive Board. 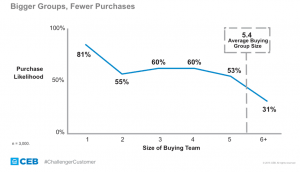 Here’s the bad news: with the typical-sized buying committee, 5.4 people, chances are that they will stick with the status quo more than half of the time. In other words, your real enemy isn’t the competition – it’s the inertia that makes people stick with the status quo. 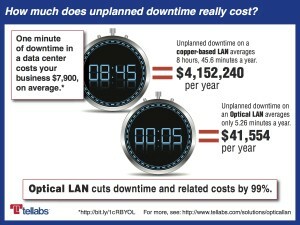 This infographic reveals $4.1 million in hidden annual costs resulting from downtime. The technical buyer wants the best technology and one that plays well with the technologies they already use. 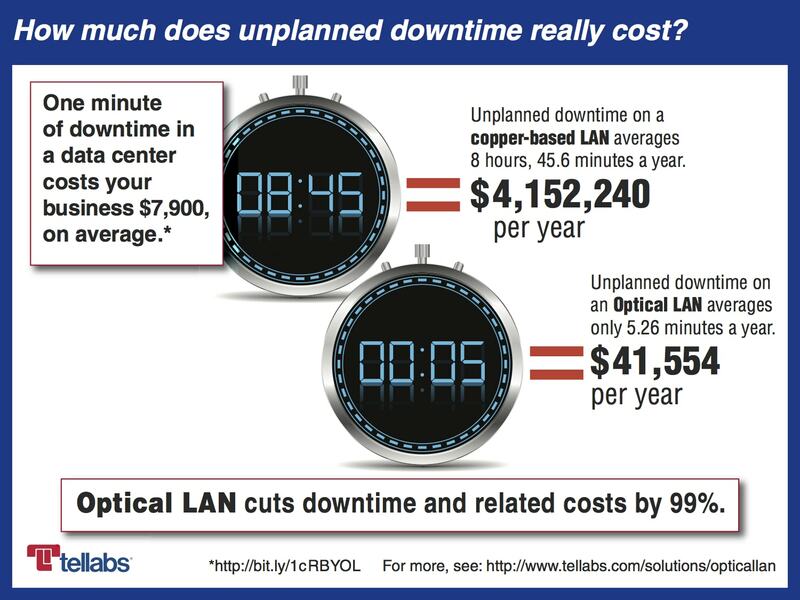 The economic buyer wants the lowest cost – either the lowest initial cost or the lowest lifecycle cost. 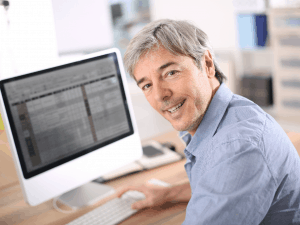 The user wants reliability, ease of transition, and the shortest possible learning curve. The green buyer wants a smaller carbon footprint, less energy use, and less environmental impact. No wonder buying committees usually stick with the status quo. As a marketer, you need a message that’s relevant to each buying decision-maker, while keeping your overall message absolutely consistent. 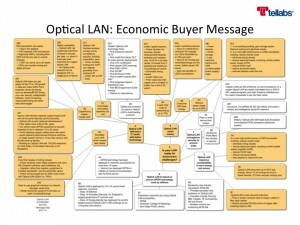 You can achieve that by creating a set of Message Maps that are color-coded to each buyer’s needs. 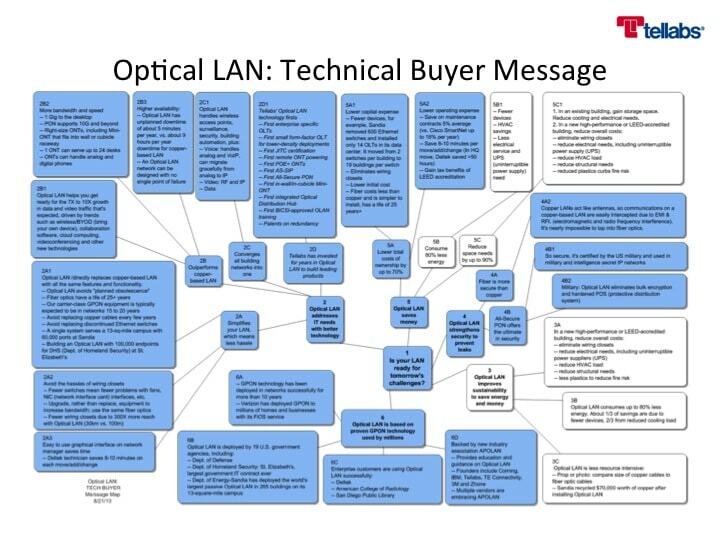 For example, at Tellabs we created one consistent Message Map, then color-coded it as follows. Color-code messages by buyer persona. 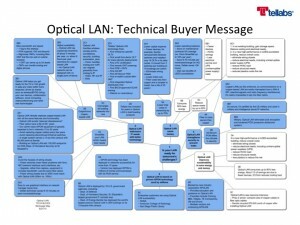 The highlighted parts of the message address technical buyers. Color-code messages by buyer persona. 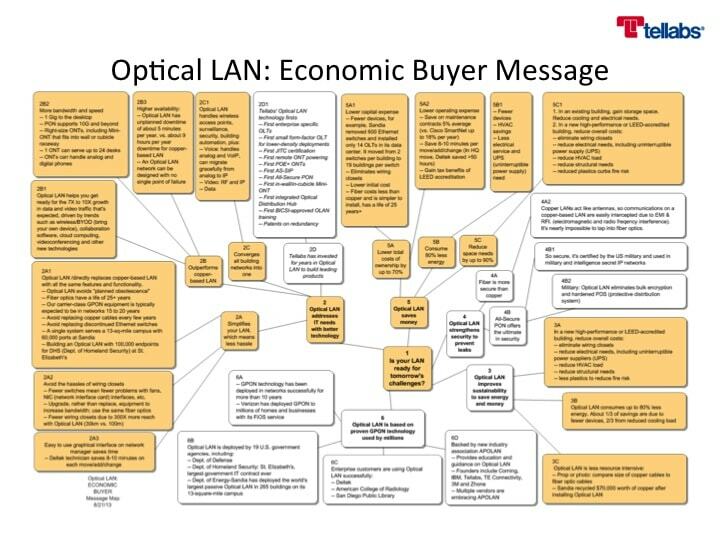 The highlighted parts of the message address economic buyers. Color-code messages by buyer persona. 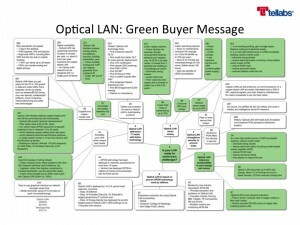 The highlighted parts of the message address green buyers. Note that the black-and-white parts of the message are absolutely consistent. 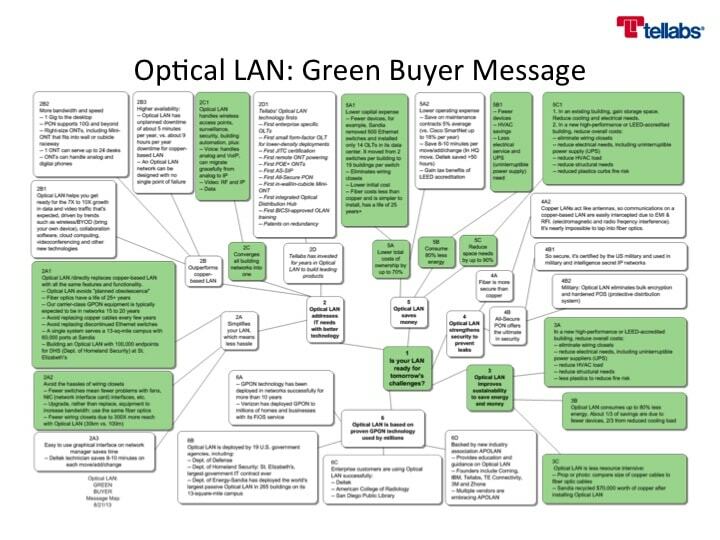 Since each version of the Message Map is color-coded, only the relevant parts of the message go to each buying committee member. If a buyer says, “So what? Who cares?”, then you’ve just said something they consider irrelevant. Learn from that experience. There’s no point in delivering a message that a buyer doesn’t care about. Get to know your buyers through buyer persona research, analyzing buyer questions, or both. Use content analytics to learn from buyers who use your content. Create color-coded Message Maps to ensure that you only deliver the relevant parts of the message to each member of the buying committee. Together, these practices will enable you to consistently create content that effectively works across various audiences. 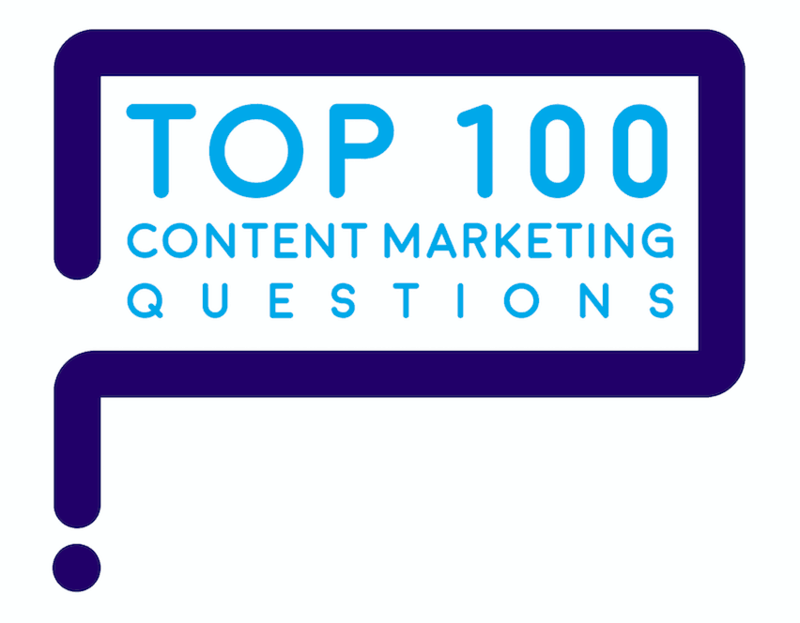 Here are more answers to marketers’ Top 100 Questions on content marketing.